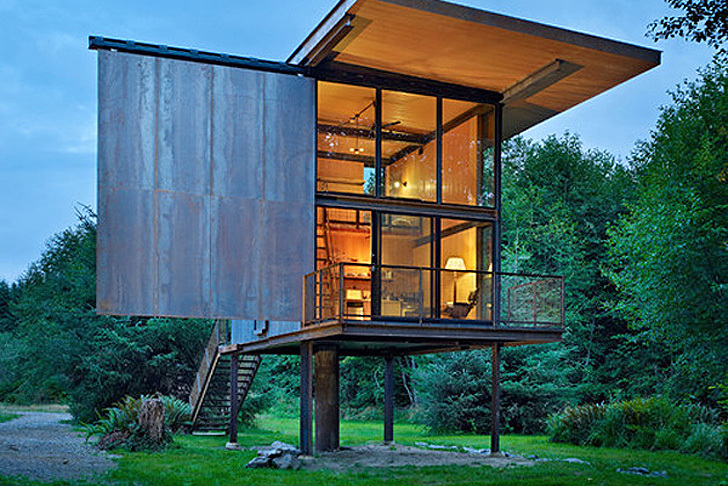 The Sol Duc Cabin is the latest project to come from the office of Inhabitat favorite, Olson Kundig Architects. Located in the Olympic Peninsula, Washington, this small retreat is perfect for taking fishing trips to the nearby river, or spending some quality time immersed in nature. Made from materials that have been prefabricated off-site, this cute and comfortable shelter is near suspended above the ground on four stilts for minimal impact on the land. 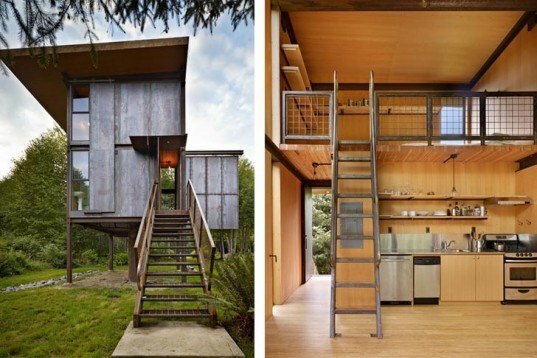 Sol Duc Cabin was constructed primarily from unfinished, mild steel and structural insulated panels (SIPs) — all prefabricated off-site to reduce waste and maximize respect for the area. Four steel columns raise the shelter above ground for minimal impact, while protecting the building from the occasional floods of the nearby river. The cubic cabin has two well-equipped levels, holding an entry, dining, toilet and kitchen areas on the bottom floor, and plenty of room for rest on the top level. The steel-clad 350 square foot interiors are made from wood, contrasting with the rugged patina of the exterior that will continue to blend and evolve with the surroundings as time goes by. To secure the shelter throughout the seasons, the Prefab Sol Duc Cabin has shutters on each façade to keep it nicely shielded from the elements.